These Black Pines catch the last rays of a summer afternoon in the mountains. Speaking of mountains, we took a drive in the forest the other day and found a lot of nearly ripe huckleberries. We're going back this weekend to pick. I can already taste the huckleberry pie. The berries are at an undisclosed location...don't try to follow us. It's a great pleasure to work with oils for this project. 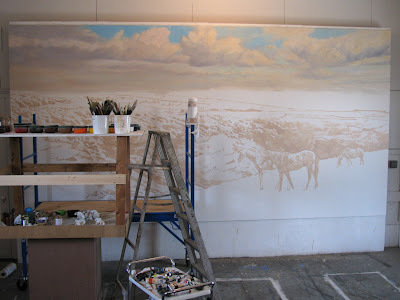 Many of my murals have been on exterior walls, where acrylic paint is best suited. 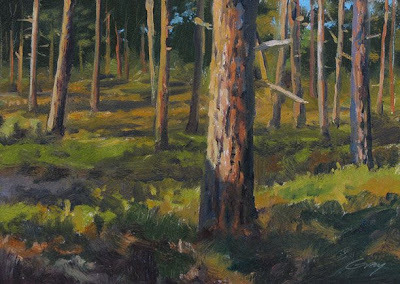 Soft blends with acrylic are challenging on large scale, because of the rapid drying time. It feels like such a luxury to have the blending capabilities of oil. Notice my patented two-story taboret at the far left. I needed a way to get my palette and tools up higher while working on the scaffold, so I built another level on top of the existing tabletop. It all rolls around on wheels. Works like a charm. Very cool to see the mural in process and your setup. Love that two story palette! Thanks, Deborah. Yes, I think everyone should have a high-rise palette! Wow! 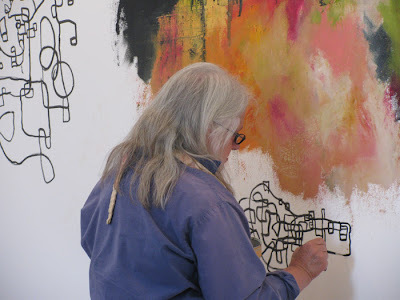 Your mural looks great; I hope you'll post some more in-progress shots. Thanks, Leslie. I'll post some more shots soon, I hope. I plan to be working away on it.